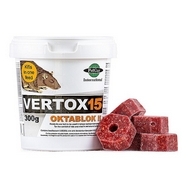 Vertox Mouse Poison Bait Blocks 15 x 20g are ready to use mouse and rat bait blocks that kill mice in one feed. * For control of mice in and around buildings. * Specially adapted mouse blocks to be more attractive and palatable to mice even in damp conditions. Low level of mouse activity use 1 block every 5 metres where activity of mice is found. High level of mouse activity use 1 block every 2 metres where activity of mice is found.